“On again, off again… like the rhythm of rain…. …We need to decide, find an end to this game.” First they were three, then they were still three, although with a change in line-up, then they were two, then three again and now they are four! The Dutch soap opera called The Toppers have had yet another chapter written to it. 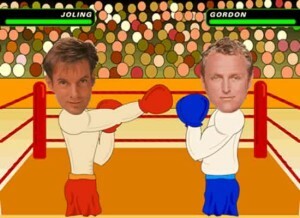 The Dutch have for years known about the fights between Gordon and Gerard Joling. When De Toppers, as they are called in the Netherlands, were selected to represent the country at this year’s Eurovision Song Contest the whole world became aware of it. Gerard Joling left the popular trio when Gordon accused him of being the reason their manager ended up in the hospital with a heart-attack. Jeroen van der Boom replaced him, but we all knew what they themselves didn’t want to admit; that it wasn’t over between Gordon and Joling. They had been breaking up many times before, but also found their ways back to each other. They might not be able to live with each other, but they can’t live without each other either. A while ago we could report that Gordon had left De Toppers and that rumours indicated that Gerard Joling would replace him. This was quite realistic as he despite a successful solo career also missed the glitter and glamour sold out- concerts The Toppers had at the biggest arenas in the Netherlands. If he could return to that and even be without his number one enemy surely he couldn’t resist – and indeed he couldn’t. Gerard Joling is back being a Toppers, but so is Gordon! Explanation needed? Well, it appears like they have once again settled their disagreements. But what about Jeroen van der Boom then, has he left now that De Toppers are intact again? No, Jeroen van der Boom is staying – and the trio is now a quartet! If people can’t keep track of how many and who is a member of De Toppers it is no wonder. We can’t predict who the next to leave this group is, but we can with almost 100% guarantee that there is more to come. The last chapter in this soap opera hasn’t been written yet – and it won’t surprise many if one or more of the current members are to get another go at the Eurovision Song Contest. Gerard Joling had his turn in 1988 with Shangri-la and here in 2009 Gordon, René Froger and Jeroen van der Boom entertained Moscow with their Shine though they failed to bring the country back to that final they haven’t been in since 2004. Advance: Press the D key. Go back: Press the A key. Throw a punch: Press the S key. Advance: Press the 4 key. Go back: Press the 6 key. ← Bosnia and Herzegovina Issues Invitation For Eurovision Song Contest 2010.